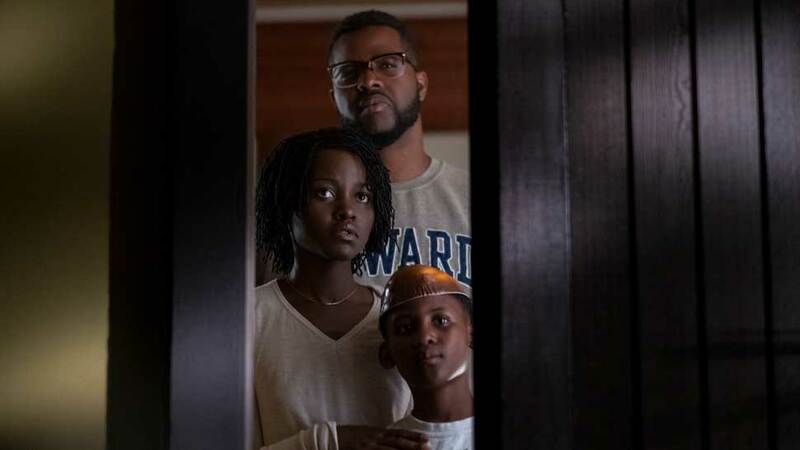 “Us,” writer-director Jordan Peele’s follow-up to 2017’s “Get Out,” is yet another meticulously crafted, spellbinding thriller. Like its predecessor, it doesn’t rely on jump-scares and “gotcha” setups. Instead, Peele takes even the most innocuous and ubiquitous objects in modern American life and renders them ominous and foreboding. His cast then reacts to those objects and scenes, and the performances Peele coaxes from his performers are once again riveting to behold. The result is nothing short of superior suspense. It will have you thinking, puzzling, marveling even as you’re on the edge of your seat. “Us” begins with a what should be the portrait of American family bliss: Mom, Dad, and child enjoying a day at the beach. That bliss is shattered by trauma when the child, Adelaide, wanders off and gets lost. Decades later, the now-adult Adelaide Wilson (Lupita Nyong’o, “Black Panther“) is a mother, herself. Moreover, she’s part of a loving family: Man-child husband Gabe (Winston Duke), older sibling Zora (Shahadi Wright Joseph) and youngest child Jason (Evan Alex). On the outside, Adelaide seems more than fine. She’s cool, composed, a capable mom and grounded presence to balance her gentle giant spouse. But that veneer slowly erodes when Gabe brings the family on vacation and insists on a trip to the beach. Unbeknownst to him, it’s the very same beach where Adelaide got lost, and the return triggers anxiety she’s barely able to contain. It all explodes into the open when they encounter another family of four with frighteningly familiar faces. They’re not just familiar: it’s them — doppelgangers, each a twisted mirror of the Wilsons. The doppelgangers aren’t friendly, either. What drives them doesn’t become clear until the very end. How they intend to get there is clear from the start: with pain, violence, and blood. Like “Get Out” before it, “Us” can be read so many different ways. Of course, through and through it’s a horror film, a nightmare brought to artful life. Tightly constructed, efficiently paced, there’s not a single image or narrative beat that’s wasted here. Everything’s there to add to the tension and build up the dread. But Peele goes beyond just setting up characters to get killed off via bloody mayhem. His writing informs them, fills them out with such tangible, relatable concerns that in turn add richness and complexity to the film as a whole. The result is a film that’s far more than just a horror film. With sly commentary about American preoccupations with “Keeping up the Jones’s”, family life stereotypes and duality in public and private lives, he delivers so much for audience members to chew on long after the credits roll. The cast of “Us” takes what Peele gives them and work their butts off to deliver on its potential. To be specific, they’re all pulling double duty, playing dual roles. What makes it even more complicated is that the characters each performer plays are so vastly different, despite sharing certain defining traits. The standout performance here, without question, is Nyong’o’s. It’s both mesmerizing and exhausting to watch her as both Adelaide and her double. Her voice, posture, and movement all change between the two to the extreme. One can only imagine the physical and mental toll it must have taken to pull it off, but she nails it. The cast around her all follow her lead, despite each having different challenges, and they each deliver. There’s so much about “Us” that can’t be discussed without ruining the film. Suffice to say, though, that if you enjoyed “Get Out” you’re going to appreciate what Peele delivers here. To be fair, that film was a little less subtle than this one in terms of how it goes about its business. The laughs were arguably a little bigger in “Get Out,” the themes and ideas a little broader and recognizable. In “Us” it seems he’s out to challenge viewers. That’s not to say it’s not any fun — it’s a wild, terrifying ride that plateaus then continues to escalate in intensity. But there’s more to it than just the thrill ride. You’ll just need to see it for yourself to understand. 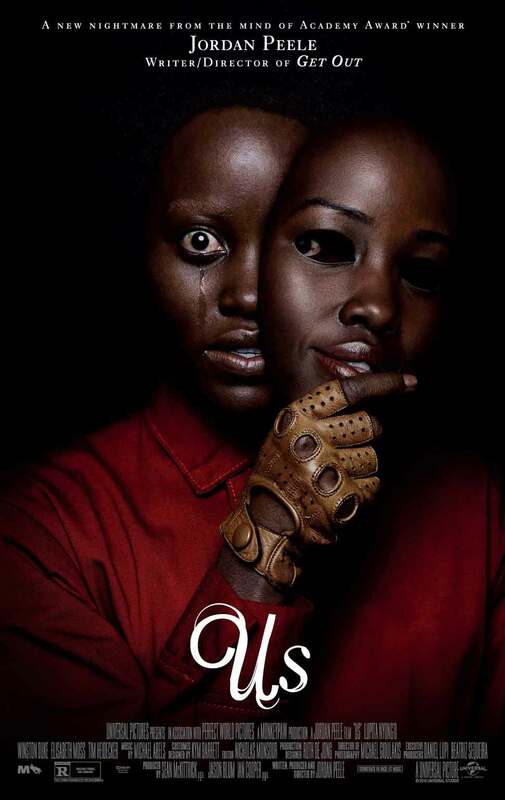 Starring Lupita Nyong’o, Winston Duke, Elisabeth Moss, Tim Heidecker, Yahya Abdul-Mateen II, Anna Diop, Evan Alex, Shahadi Wright Joseph, Madison Curry, Cali Sheldon, Noelle Sheldon. Directed by Jordan Peele.